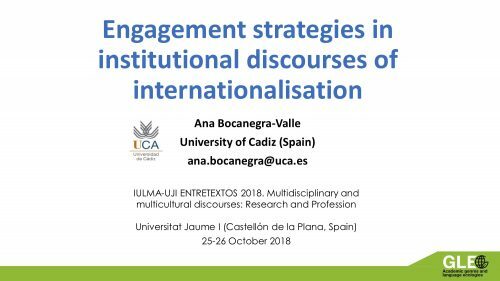 Ana Bocanegra-Valle attended the IULMA-UJI Entretextos International Conference 2018 on Multidisciplinary and Multicultural Discourses: Research and Profession (25-26 October 2018, Universitat Jaume I, Spain). The title of her presentation was “Engagement strategies in institutional discourses of internationalisation”. Universities around the world have invested great efforts in the internationalisation of their education and research, developing modern internationalised programmes that go beyond student mobility (e.g. internationalization of the curriculum, promotion of international employability) and aim at a “comprehensive internationalization” of higher education (Pérez-Encinas et al., 2018). This trend has become particularly evident in Europe in recent years, where strong internationalisation policies have been implemented and institutional activities have been prioritised across universities (European Parliament, 2015). This study seeks to delve into the discursive strategies that recur in internationalised universities’ websites with a view to connecting with the audience and engaging students to become a part of a particular university community. The overarching aim of this paper is, thus, to explore university discourse, as an example of institutional discourse. The dataset draws on textual data provided by the “Why to study at …” sections of ten European internationalised universities websites. Analysis is mainly based on the analytical models and findings of Askehave (2007) and Teo (2007) who, following Fairclough (1993) and the tenets of Critical Discourse Analysis, explored the language of international student prospectuses and other university documents. It also takes into account the model of interaction in academic discourse and the taxonomy of linguistic features developed by Hyland (2005) for the investigation of academic writing and the interpersonal dimension of discourse. The main findings point at a number of discursive strategies such as the use of personal pronouns, the use of questions and directives or the use of particular verb tenses to generate first-hand interest in that particular university and engage prospective readers (students and/or their parents/tutors) through an interpersonal dialogue towards effective enrolment.